● Aric Almirola started 16th and finished Stage 1 in ninth to earn two bonus points. ● Almirola’s first pit stop of the race was on lap 37 for fuel, four tires and adjustments to help his car’s loose-handling condition. ● The Tampa native moved into the ninth position in the closing laps of the stage, where he ultimately finished. ● During the stage break, Almirola came down pit road for service to his Smithfield Ford Fusion. ● Almirola started Stage 2 in ninth and concluded it in 16th. ● Shortly after the green flag dropped on Stage 2, the first caution of the race was displayed while Almirola was in the 12th position. ● The second caution came out on lap 111, and Almirola visited pit road from 17th for service to tighten up his No. 10 Ford. The Smithfield crew also worked on the right-rear quarter panel after he brushed the wall. ● Almirola restarted 21st on lap 116. ● By the end of the stage, Almirola was happier with the handling of his Smithfield Ford and had worked his way up to the 16th spot. ● During the Stage 2 break Almirola visited pit road for fuel and four tires. ● Almirola started the final stage in the 16th spot and ended it sixth. ● The caution was displayed once again on lap 183 while the 34-year-old was in the 12th position. He visited pit road for service and restarted 14th on lap 187. ● Just a couple of laps after the restart Almirola was in 12th, the spot he held until the next caution came out on lap 213. ● Almirola came down pit road for fuel and four tires, and he restarted in the eighth spot on lap 222. ● After several late-race cautions, including a red flag on lap 267 that sent the event into overtime, Almirola was able to advance to the sixth position. 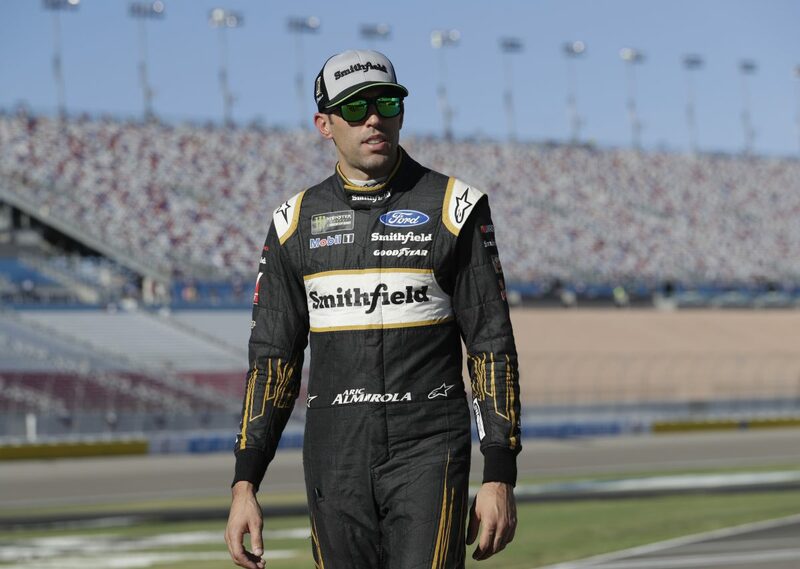 ● This was Almirola’s 11th top-10 finish of 2018 and his second top-10 in 11 career Monster Energy NASCAR Cup Series starts at Las Vegas.